We are starting “The World Karatedo Federation Kyokushin Kaikan, World Sokyokushin”. This is done in earnestely intend to succeed, and spread correctly Sosai Oyama Masutatsu’s Kyokushin Karate. As a result of Kyokushin Karate being divided into many minor groups, the number of dojos have increased suddenly and dramatically all over the country. It is good that we can train easily, but some people who use the name ‘Kyokushin’, are not in fact real Kyokushin shihan, but are only trying to gather students. Two shihan are concerned about this situation. After Sosai Oyama passed away, Kyokushin Karate was divided into minor parties and became mixed up. 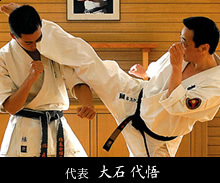 Receive Kyokushin Karate correctly, purely, and get down to Keiko. Those who do not follow the correct way. Those who declared themselves ‘sensei’ or ‘shihan’. They use the name of Kyokushin, however they are not. “Can he really do Karate?” “Does he really know Karate?” These suspicious people call themselves ‘shihan’. In spite of this, people all over the world have come to strive to seriously practice Pure Kyokushin Karate. The other Hanshi, Daigo Oishi is the president of the new organization (Sokyokushin). He became a pupil of Kyokushin Kaikan So honbu dojo in 1969. He won the 3rd prize of the 3rd Japan Tournament and 4th prize of the 6th All Japan Tournament. And in the memorable 1st World Tournament he won the 4th prize. Because of his excellent record, he became Sosai’s Uchideshi and was given masterful instruction for 5 years. His foot work was sharp and called ‘Yoto Muramasa’. Because Oishi Shihan’s technique had a sharpness and deadly force that reminded Oyama Sosai of this famous sword ‘Yoto Muramasa’. He was also acclaimed as the “genius of kick work” by Sosai Oyama. He established the Yamanashi branch in 1976. He also established the Shizuoka branch in 1977. He was always on the front line like Shihan Hasegawa. Kazuyuki Hasegawa is the Hanshi who is the Supreme advisor of the new organization (Sokyokushin). He became a pupil of Kyokushin Kaikan So honbu dojo in 1967. He won the 3rd prize in the 1st All Japan Tournament in 1969. He had a brilliant championship in the 2nd tournament of the next year. His nickname is “The small giant”. He established the Tokushima branch dojo from 1970. (He also established the Aichi branch dojo in 1978). Moreover, as a leader, he has brought up many world champions and all Japan champions. He contributes immensely to Kyokushin Kaikan. First of all, these two Hanshi are having steadfast and they are in charge of instructing still now. This is the feature of Sokyokushin. ‘Saying neither the status nor a title.’ Both Shihan that command the organization who wears karategi and are sweat instructing shed in training at dojo still now. This is just an only the best means of succession and tradition of the right Kyokushin Karate. The World Sokyokushin’s president Oishi Hanshi, and Supreme advisor Hasegawa Hanshi, are Oyama Sosai’s direct pupils. Their Karate is ‘pure Kyokushin Karate’, directly from Oyama Sosai. To succeed and hand down correct Kyokushin Karate without impurities, and to continue development together, regardless of groups or factions, are aims. People both inside and outside of Japan who support these aims will raise the quality of Kyokushin Karate. There is no unilateral promotion. It may take, rigorous examination and “official recognition” which can be announced publicly presuming ‘kihongeiko’, ‘idogeiko’, ‘kata’, ‘hokyo’, ‘kumite’. Of course, about tournaments, we also hold them with the same idea in mind. They are not a mere trial of one’s strength, and number collection, but they are ‘Budo Tournaments’, appropriate for Kyokushin Karate. Additionally, we have a website, and periodically publish media, such as magazines, to disseminate information about Kyokushin Karate activities. Please visit our website, and reflect upon the history of Kyokushin. Let’s return to the heart of Kyokushin.